Sandy: So you know that tomorrow is actually the Eighteenth Anniversary of the famous Fins-Cowboys game and as we know now that loss did not stop the Cowboys from winning the Superbowl that year. Everything turned out great, but I was curious as to what Jimmy Johnston said to you in the locker room that day? 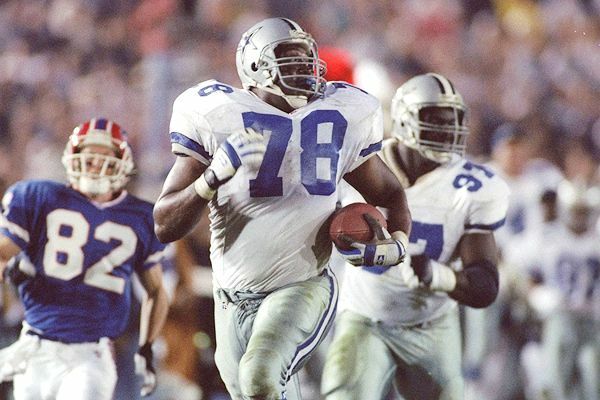 Leon Lett: Well, I think the first thing that Jimmy said to me was “hey you are my guy and do not worry about this. We are going to get through it. As long as I am here, you will be here.” So that was excellent for me and I am just thankful to my good friends at Snickers for giving me this opportunity to have fun with this. They put a great twist on the story. We had the “Play Hungry” campaign. Russell Maryland was supportive, Chad Hennings, Darren Smith. It just turned out to be great. I am riding high right now, but I am also humbled by this experience. All the fans that supported me, forgave me and showered me with forgiveness. It has been great, it really has. I am looking forward to going ahead here. The boys will have a great game against the Dolphins and get on a magical run for the Super Bowl. Sandy: Some of your friends were in that video. Are those you close friends today from the team? Leon Lett: Yeah, we are relatively close. Russell and I speak very often and Chad Hennings is a great friend of mine. I love those guys for showing up and being a part of it. Like I said before, Snickers put a great twist on the story. So it has been great. Sandy: It was a very good twist. Which one of your Super Bowl wins is most meaningful to you? Leon: That would have to be Super Bowl XXVIII. I have the ring on right here. It is because it was the year that of the infamous blunder, but we won the Superbowl. It was a back-to-back championship. Two in a row. I made a couple of plays and contributed real big to winning the game. Sandy: Right now, you are on the Cowboy’s Coaching Staff. How is that going? Leon: It is going great. The Cowboy’s Coaching Staff is excellent. I am like a humongous sponge just soaking everything up. I could start with everyone of the guys, a big list of guys. Defensively – Rob Ryan, Dave Campo, Brett Maxie, and my man Brian Baker, who I work closely with and I am just soaking it up. He is a sixteen year veteran and defensive line coach. He has a great deal of knowledge on technique, philosophy and terminology. As a football player I can relate to everything he is saying and I love that part of it. Rob Ryan is especially tremendous at what he does. He is calm and relaxed. The guys love working for him and I love being a part of it. Ben Bloom – I will give you all the names so we do not leave anyone out. It would be Ben Bloom, Dave Borgonzi, Dave Campo and you have all the other names that I named. Working with those guys has been great and Jason Garrett has brought me in and made me feel like I am a part of this thing and I am just happy to have an opportunity to contribute. Like I said earlier, Snickers, it is the day for Snickers and I got to make sure we going to keep taking. Sandy: (interrupt) I am going to keep talking about Snickers, but fans want to know more about you because they always saw you as being very shy and now we are seeing the outgoing side of Leon. Leon: That is true and I give God the glory and the thanks because eighteen years you couldn’t get me on the back of this Mustang. So Snicker’s has done a great job of putting a twist to this. I got the call and I was at my office at ULM, and they said that they want to use me in the Snicker campaign. I asked who was playing games with me. I thought it was a joke. Obviously it wasn’t, I am here. I did it mainly to move on and have some fun with it and I am thankful to the good people at Snicker’s for doing this.